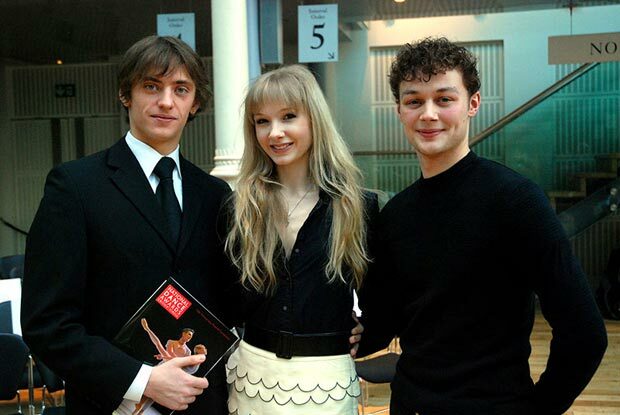 Liam Scarlett, along with Melissa Hamilton and Sergei Polunin, at the 2009 National Dance Awards – where they were all nominated. © John Ross and taken from Graham Watts report of the Awards for Balletco. Click image for larger version, or one that fills the browser window. Kevin O’Hare, Director of The Royal Ballet, announced today that First Artist Liam Scarlett is appointed the first ever Artist in Residence of The Royal Ballet, a position that will allow him to focus solely on his choreographic work. Scarlett will take up the new role with immediate effect and will make his last appearances with the Company as a dancer in the current run of Swan Lake. Scarlett’s latest work Viscera receives its UK premiere at the Royal Opera House tomorrow night. Scarlett joined The Royal Ballet in 2005 and was appointed First Artist in 2008. His natural flair for choreography was encouraged and supported by both The Royal Ballet School and The Royal Ballet and Scarlett has developed a distinctive choreographic style which has received extensive praise with commissions from around the world. His appointment continues The Royal Ballet’s history of nurturing the next generation of choreographers. The variety of choreographic talent is further enhanced with world premieres this Season from Kim Brandstrup, Alastair Marriott and Alexei Ratmansky who will be creating his first ever work for a British company. To consolidate further and underpin the Company’s commitment to choreographic development two Choreographic Affiliates, Mayuri Boonham and Alexander Whitley, will be linked to the Company through to 2014. Along with Robert Binet, currently Choreographic Apprentice, they will make work for the Linbury Studio Theatre and contribute across the Royal Opera House working with education and other departments. The Company is also delighted to announce that, through an offer of generous financial support, it has been possible to establish a Choreographic Bursary for the next three years which will facilitate young and emerging choreographers within the Company to develop their craft through exposure to a variety of experiences and projects. Liam Scarlett’s work Viscera receives it’s UK premiere at the Royal Opera House on Saturday 3 November alongside Infra by Wayne McGregor and Fools Paradise by Christopher Wheeldon. Born in Ipswich, he trained at the Linda Shipton School of Dancing and then at The Royal Ballet Lower and Upper Schools. In 2005, after graduating, he joined The Royal Ballet, and in 2008 was promoted to First Artist. Liam’s interest in choreography began while at The Royal Ballet School where he won both the Kenneth MacMillan and Ursula Moreton Choreographic Awards and was the first recipient of the De Valois Trust Fund Award. While still at the School he was commissioned to create Monochromatic (2004) and Allegro de Jeunesse (2005) for The Royal Ballet School’s Annual Matinee performances at the Royal Opera House. He continued to develop his interest through ROH2’s Dancelines, led by Kim Brandstrup. For The Royal Ballet he created Despite and Vayamos al Diablo (ROH2’s In Good Company, 2006), and has frequently choreographed for The Royal Ballet’s Draftworks. He has worked closely with many dancers in the Company to create several pas de deux and Gala pieces for worldwide performance; these have included Nocturne, Reverie, Somente and Fantasie-Impromptu. For Ballet Black in the Linbury Studio Theatre he created Hinterland (2006) and Indigo Children (2007), both of which have been revived. In 2009 Scarlett took part in the autumn workshops of The New York Choreographic Institute at their invitation, creating Gargoyles with members of New York City Ballet. He has twice been nominated for a Critics Circle Dance Award for Best Choreography for Of Mozart (2008) and Consolations and Liebestraum (2009), both for The Royal Ballet’s New Works performances. His first main-stage work for The Royal Ballet was Asphodel Meadows (2010), nominated for a South Bank Award and an Olivier Award and winner of a Critics’ Circle Award. It was followed in 2012 by Sweet Violets. His ballet Viscera, created for the Miami City Ballet entered the repertory of The Royal Ballet in the 2012/13 Season. Scarlett also choreographed Diana and Actaeon with William Tuckett and Jonathan Watkins as part of Metamorphosis: Titian 2012.